The first leg match of the Champions League quarter-finals 2017/18 brought Barcelona against AS Roma. The match was held at Camp Nou on Thursday (05/04). Rome proved itself as a tough opponent to be conquered. Although not parking the bus, Rome can stop Barca attacks systematically. But two goals by suicide, each by Daniele De Rossi and Kostas Manolas make the hard work of Rome vanished. Gerard Pique also scored, as did Luis Suarez. Roma can only reply one through Edin Dzeko. Rome shows an organized game. Not attacking off as they usually demonstrate, Roma's priority is to stop Barça attack efforts before reaching their defense. Roma impose a fight going on in midfield so their back line is relatively safe from danger. The controversy occurred when Edin Dzeko was pushed from behind by Semedo and fell into the penalty box. But the referee did not see any violations. The slick game of Rome was finally tarnished when Daniele De Rossi misjudged the ball for Lionel Messi. Efforts de Rossi to secure the goal even fruitful own goal because the ball slid into the bottom corner of his own net in the 38th minute. A minute later, Lorenzo Pellegrini violated Samuel Umtiti on the edge of the penalty box. But the referee argued that the offense took place outside the box and only gave away a free kick. The first half was closed with the score 1-0. In the second half, Roma again suffered an own goal. Kostas Manolas twice wrong anticipate Barca cross. Manolas's first clearance attempt hit the post, the ball rebound hit his leg again, and this time fruitful own goal scored during the second half walked ten minutes. Four minutes later, Barca added another advantage over Gerard Pique's close-range goal. Luis Suarez fired a shot that could be denied Alisson but the ball rebound struck Pique to change the score to 3-0. Edin Dzeko opened Roma's hopes through his goal in the 80th minute. Receiving a mature pass from Diego Perotti, Dzeko scored with a directional shot from close range in the 80th minute. Barcelona secured their big win with goals scored by Luis Suarez in the 87th minute. Utilizing Manolas elementary error, Suarez grabbed the ball to score to end the game with a score of 4-1. Both teams will still play in the second leg at the Olimpico Roma next week. 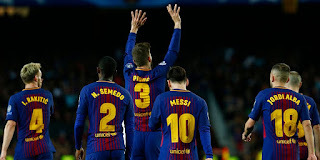 The composition of Barcelona players: Marc-André ter Stegen, Samuel Umtiti, Gerard Piqué, Jordi Alba, Nélson Semedo, Ivan Rakitic, Sergio Busquets (Paulinho), Andrés Iniesta (Denis Suárez), Sergi Roberto (André Gomes), Luis Suárez, Lionel Messi . The composition of AS Roma players: Alisson, Federico Fazio, Kostas Manolas, Aleksandar Kolarov, Bruno Peres, Lorenzo Pellegrini (Maxime Gonalons), Kevin Strootman, Daniele De Rossi (Gregoire Defrel), Diego Perotti, Alessandro Florenzi (Stephan El Shaarawy), Edin Dzeko. 0 Response to "Match Result Barcelona vs AS Roma: Score 4-1"